What’s the difference between sea ice and an ice shelf? 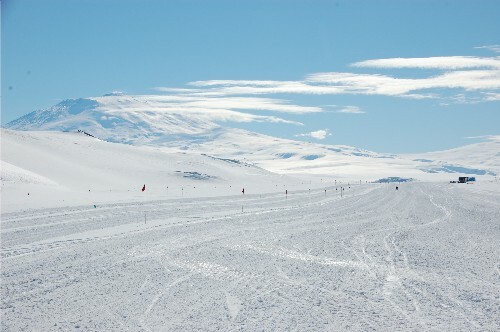 As far as landscape features near Ross Island, Antarctica go, there is little difference in appearance between the two. However, there is a big difference as far as stability goes. 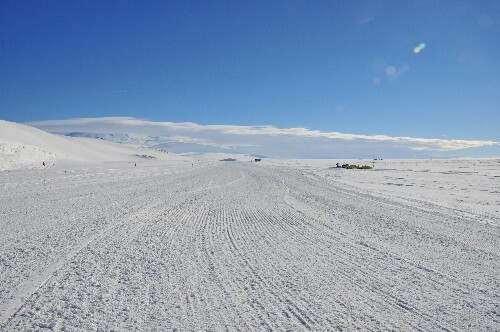 Last weekend, McMurdo Ice Marathon participants skied and ran on the McMurdo Ice Shelf (pictured above, groomed for vehicle and recreational travel). It’s late-summer now in Antarctica, and the ice shelf doesn’t melt…but it could possibly melt in the future if global temperatures continue to rise. Generally, an ice shelf is the thick layer of ice formed by an ice sheet or a glacier that bridges the area where a frozen continent, such as Antarctica, meets the sea. 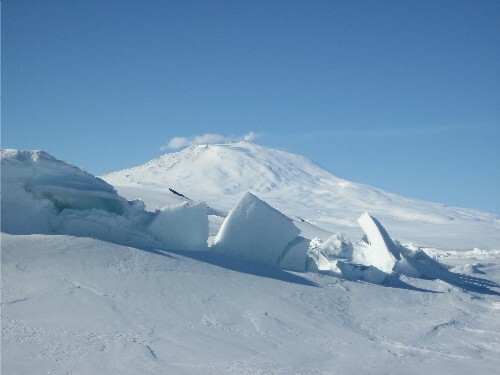 There are lots of glaciers around here…especially at the base of Mount Erebus (below), the world’s southernmost active volcano. Whereas an ice shelf is a thick, floating platform, sea ice is the thinner, non-permanent ice that extends from the ice shelf and floats like a crust on the water below it. Early season at McMurdo, the sea ice is thick enough for planes to land on it, which is nice logistically because the sea ice runway is only a fifteen-minute shuttle ride away from town. But by the first week in December, the landing strip gets moved onto the ice shelf, and it takes forty-five minutes to reach by shuttle. 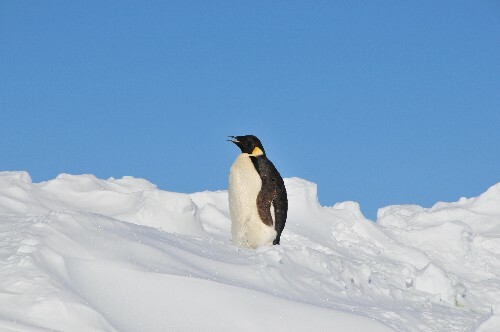 Penguins, such as the Emperor Penguin above, aren’t sighted very often at McMurdo because they live in breeding colonies, none of which are super close to town. Emperor Penguins, however, are known to make long journeys to mate and feed offspring. They’re inclined to travel, these birds, but even so, it’s exciting to see them in our area—this one sighted on the McMurdo Ice Shelf near the Pegasus late-summer airfield. 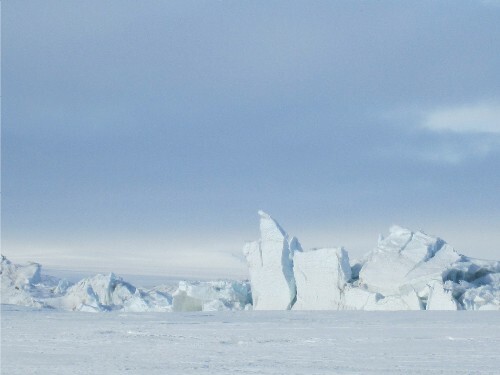 One of the things I appreciate about being able to ski out on the sea ice or the ice shelf surrounding Ross Island is the chance to feel like I’m out in the wide-open. Sometimes it feels crowded in town with our population of 1,000 people crammed into little spaces and eating together in the galley. Our personal lives and professional lives sometimes get too intertwined. But when I’m outside with so much flat, open space around me, my worries melt into the surroundings. You can run or ski away from your worries anywhere in the world. 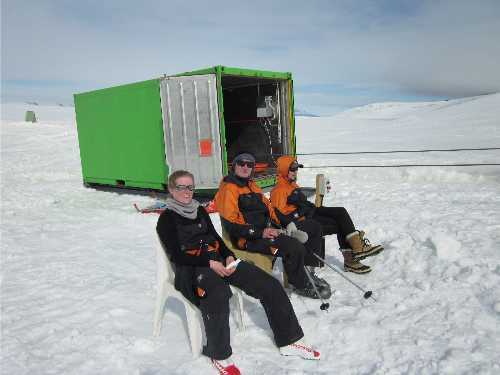 But doing it here, with a view of Mount Discovery looming across the great expanse of the McMurdo Ice Shelf, makes those worries seem so much smaller to begin with. 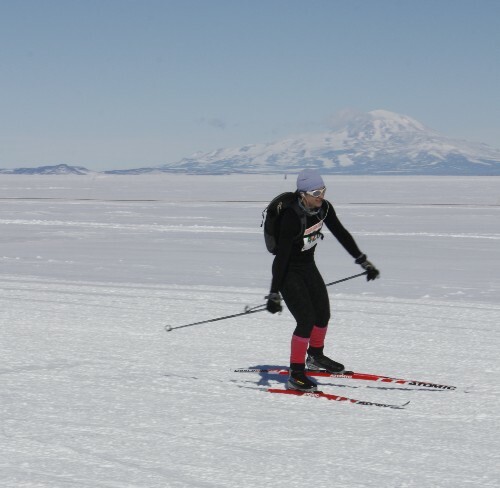 Traci skiing: Stan Schweitzer; Mount Erebus: Matt Truch; all others Dan Costa. Thanks marathon volunteer photographers! 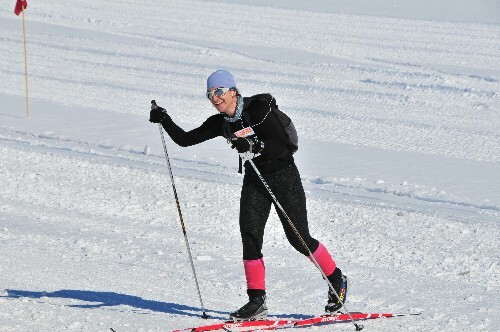 Last weekend, I entered my first-ever Nordic skate-skiing race, the McMurdo Ice Marathon. 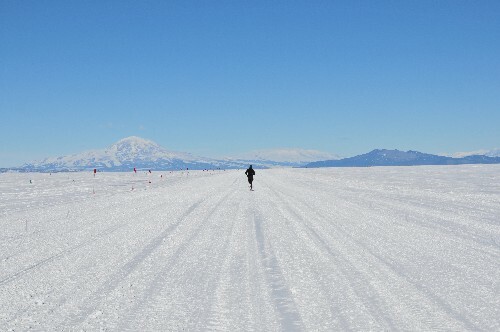 Fifty-two people raced in this out-and-back running and skiing event on the McMurdo Ice Shelf here in Antarctica. Racers could choose to run or ski the full or half marathon, and a great volunteer team of thirty-plus people came out to support the cause. 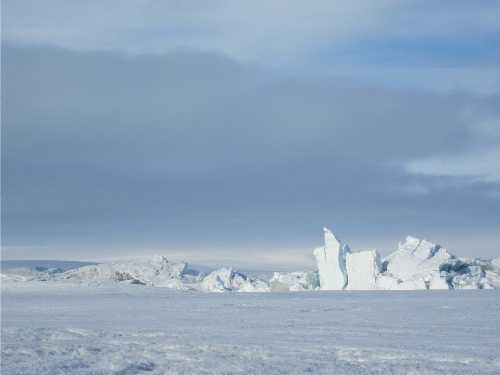 …but as soon as we transition from land to the McMurdo Ice Shelf, it’s all snow and ice, all around. 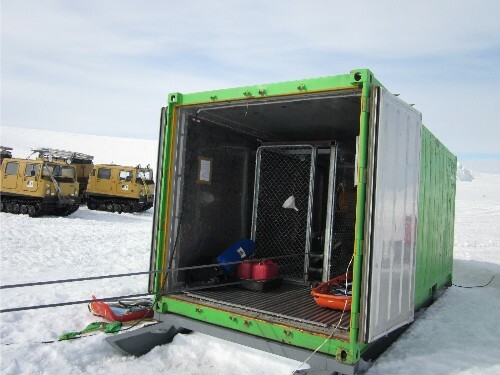 Once we were dropped off on the ice shelf, we had fifteen minutes to sort our gear and get warmed up. And then it was time for the ready…set…go!!! The morning began beautifully, and temperatures continued to climb into the mid-thirties (Fahrenheit) by noon. When I passed my friend Gracie at the turnaround, she was stripped down to her tank top and looking really strong here (she’s a total badass). Gracie ended up taking a proud second-place finish in the women’s full marathon run category. This day was one of the best days so far this season for skiing—very little wind and big blue skies. 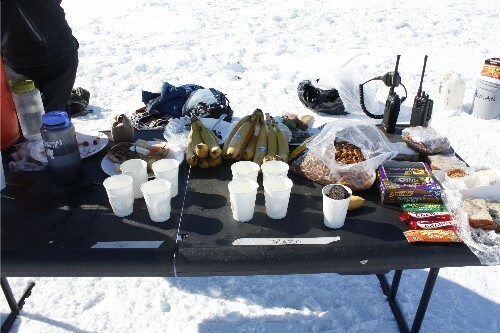 Besides—the McMurdo Ice Marathon is a once-a-year opportunity to ski supported, so I carried only a light pack and helped myself to snacks at aid stations along the way. 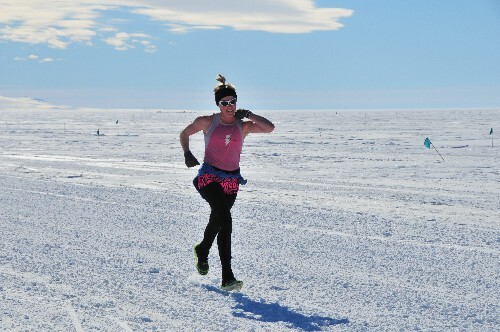 I felt strong and happy throughout the race–thanks to the hot pink leg warmers, I’m sure. The conditions were so good that I felt like I was flying on skis. 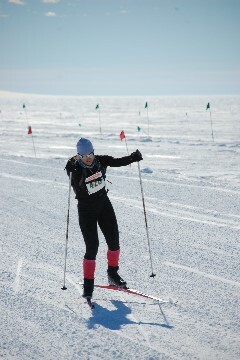 I finished with a respectable time of two hours and fifty minutes to win the women’s full marathon ski category. I was still smiling after I crossed the finish line, so it couldn’t have been that painful…right? The first-place male marathon winner, Curtis Moore, wasn’t too far behind me. It was amazing to see him running far ahead of the other runners at the turnaround point. He floated through this race and inspired everyone with his finish time of three hours and sixteen minutes. 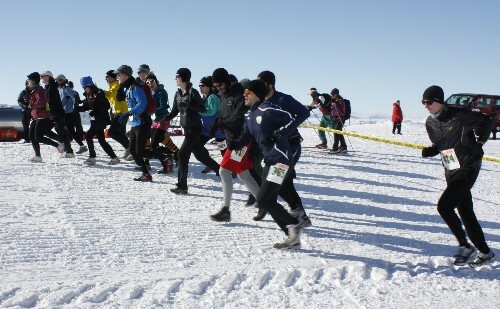 One of the things that struck me after the McMurdo Ice Marathon was how much it brought our community together. Counting participants and volunteers, more than eighty people in our local population participated. There are only about a thousand of us here right now, so I felt like it was a large percentage of participants for such a small population. It was a great inspiration to watch people I know train for this event over the past few months and then race in it. Even more of a boost: hearing volunteers shout out my name in encouragement as I skated by. 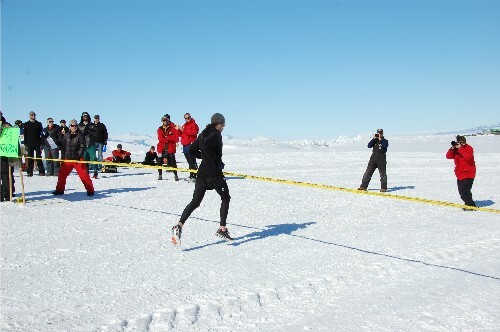 Thanks so much to the McMurdo Ice Marathon volunteer photographers for taking the above photos. 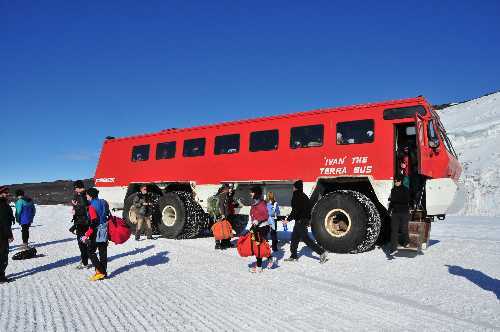 Matt Truch took the photo of Ivan the Terrabus in town and the top right photo of me skiing; Stan Schweitzer took the start line and snack table photos; Dan Costa photographed all others. Title: Caribou Island // Author: David Vann // Publisher: HarperCollins // Pub. Date: January 18, 2011 // 304 p.
David Vann’s Caribou Island was released by HarperCollins earlier this week, and even though the nearest book store is at least a frozen ocean away, I was able to have a prepub copy handed off to me here at McMurdo Station. I’m glad I did. Caribou Island is the story of a retired couple’s attempt to chase the ultimate homesteader’s dream: a cabin, on an island, in Alaska. But unfortunately for Gary and Irene, this dream is thirty years deferred, and the quest to build a cabin from scratch offsets the balance they’ve somehow managed to maintain all of these years in their marriage. Vann offers expert natural descriptions, and he creates places that mirror the psychological terrain his characters tread. Once I started reading this book, I didn’t want to put it down, mainly because I got sucked into the juicy subplot’s drama. But some of the characters in this book are a bit shallow—and shallowly written. Despite that, Van makes up for what these characters lack by turning the Alaskan landscape into a beautiful, full-bodied aspect of the story. 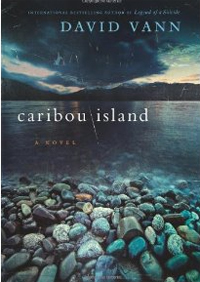 Final word: Caribou Island is equal parts drama, tragedy, and intrigue. Vann ratchets the tension just tight enough that you’ll know something is about to happen the entire time, and yet when it does, you’ll still be surprised. CLICK HERE for a link to my review of David Vann’s Caribou Island on the About.com Contemprary Literature website. It’s a bit unsettling to know that pressure ridges are caused by cracks in the sea ice…and that they’re located in such close proximity to the area where we access ski routes on the ice shelf. 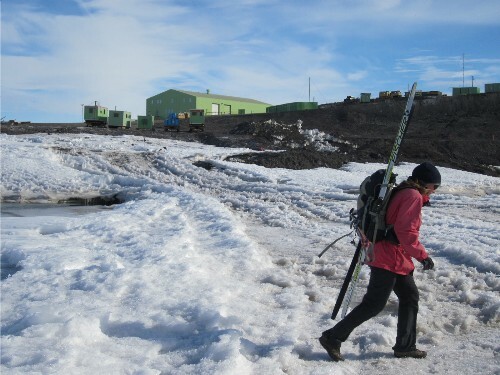 In order to leave Ross Island for the super-smooth Nordic skiing on the McMurdo Ice shelf, we have to walk or ski through the land-to-ice transition. My roommate, above, is tiptoeing through the slush. It’s safe—really, it is—but I sometimes feel like I’m going to step into a slush pool and fall all the way through the ice to the sea floor. So I tread carefully, prodding with my poles at any suspicious-looking pools of water. And then when I’m safely beyond transition, I simply enjoy the view. 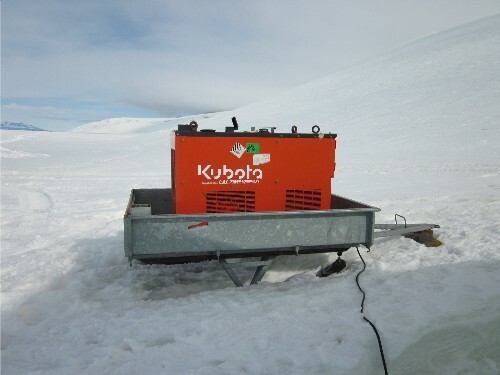 What do you get when you’ve got a bunch of super-keen Kiwis in Antarctica…and a Kubota generator? The generator powers a single rope, which users attach themselves to with a harness and a clamp called a nutcracker. 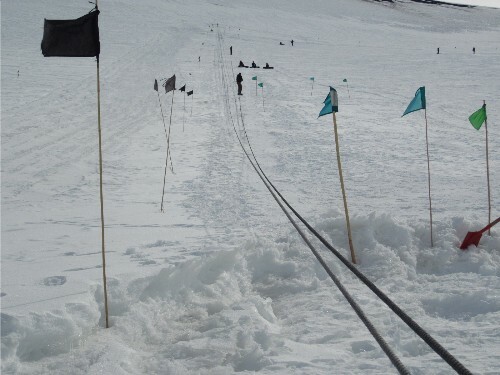 This type of system is common at New Zealand’s club ski fields…though I can’t say I’ve skied on it anywhere else in the world. Only five people can be on the rope at one time, and once you get to the top, there’s not really any good snow or much terrain to explore. Despite these limitations, having this opportunity to ski downhill even on this gentle slope was…So. Much. Fun. I was able to use a pair of badly fitting boots and skis from the Kiwi stash, but I didn’t care about the awkwardness of it all. After so much Nordic skiing these past few months, it felt good to point the tips downhill and just let gravity do its job. 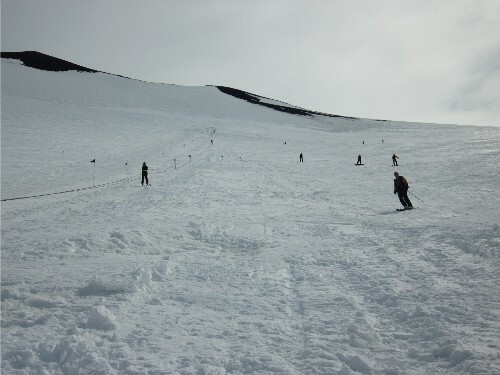 The Kiwi ski hill is an invite-only place for us Americans, so I was excited that Jana invited me for my first time out skiing here (in my fourth summer at McMurdo). The best part of the day was, for sure, the company. These laid-back, fun-loving Kiwis are good, keen people—always looking for a little backyard adventure. 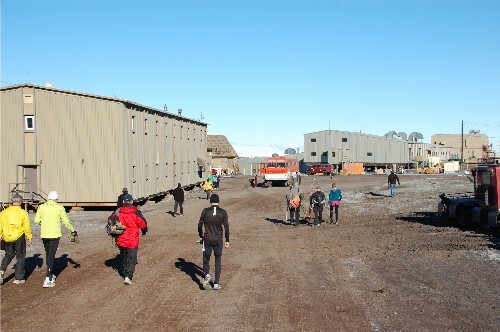 Just wanted to share a great video of my current surroundings here at McMurdo Station…and elsewhere in Antarctica. Mountaineer Forrest McCarthy set this short series of clips to music last Monday after we went skate skiing together on the McMurdo Ice Shelf. I’m the gal in the lime green jacket, mountain biking with skis and then skate skiing with an orange backpack. Forrest is the guy with the crazy teeth (don’t be too alarmed…they’re fake). Forrest is now on his way back home to Jackson, Wyoming. He worked this season with a science group called POLENET, which was based out of field camps deep in the heart of Antarctica. POLENET got a bunch of air time, hence all of the super-sweet aerial footage Forrest captured here. I love meeting people like Forrest passing through town…we had a fantastic day out skiing, and—thanks to him—I’ve got some good video to share. Cheers! 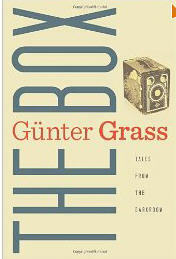 Title: The Box // Author: Günter Grass // Publisher: Houghton Mifflin Harcourt // Pub. Date: November 10, 2010 // 208 p.
Günter Grass’s The Box: Tales from the Darkroom is one of the more literary and imaginative books I’ve read lately. Sort of experimental in nature, this book’s main elements include a literary master, his family, an assistant, and her all-seeing camera. Grass writes in the voices of his eight children, and even though this book is a work of fiction, the story reveals the private life of a very public man— Günter Grass, himself, as a father, family man, and writer. Grass is the German-born author and winner of the Nobel Prize for Literature in 1999. He is widely acclaimed for his numerous successful books, including The Tin Drum, My Century, Crabwalk, and Peeling the Onion, but in The Box, Grass becomes the character of a father, toiling away on these great works while his children grow up around him. This storyline centers around the writer’s assistant, Marie, a photographer whose old-fashioned Agfa box camera takes snapshots that inspire the writer’s work, reveal shocking secrets, and even foretell the future. While the individual voices of the eight children and their families become muddled en masse, it’s Marie and the imagination surrounding her character that makes this book a pleasure to read. To read my full review of this book on the About.com Contemporary Literature website, click here.